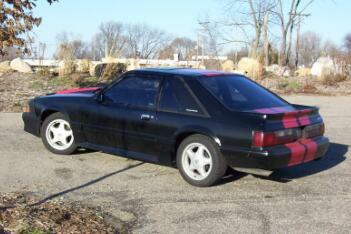 This is my 1987 Mustang LX. It arrived to me on a flatbed, painted bronze and silver. The cars exterior was in decent shape, but had no motor, floorboards that needed work, and not to mention the lack of wiring, suspension and driveline problems. Needless to say this was a serious project car. I replaced just about everything on this car. 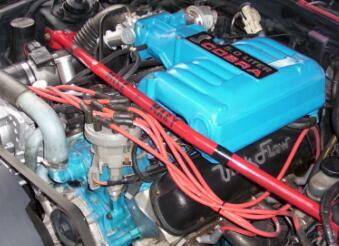 It got a complete new wiring harness, to add the mass airflow sensor. The AOD was swapped out for a 5-speed. The car also recieved all new suspension and rear axle. It came with a grey interior that was far from perfect. I had to strip the inertior anyways to replace the floorboards, so the car recieved a complete new black interior from a 1991 Mustang. I drove the car for a few weeks in the bronze and silver until I had time to fix a couple of minor spots of surface rust. I painted the car myself in the black with red stripes that you see above. Lowered Pickup points by 2"
In addition to the list above the car has also been stripped of anything I deemed unecessary. The smog pump, cats, and other emmision stuff has been eliminated. The complete airconditioning system system was removed (I decided to do this in the middle of winter, this may have not been the best of my ideas). All of the insulation from font to back has been removed, including the sound deadening rubber mat. Since I am over 6", the back seats are baiscally usless, so I removed the rear seats belts, and all seat mounting brackets. The bottom seat is actually just sitting there, and the seat back is held in by two sheet metal screws, instead of a bunch of bolts. Some ideas such as removing the second horn, and cutting bolts to length may be seem silly to some, but it all adds up.